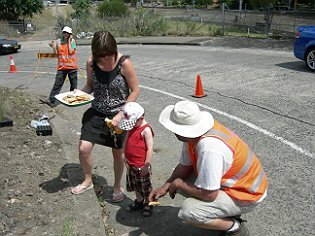 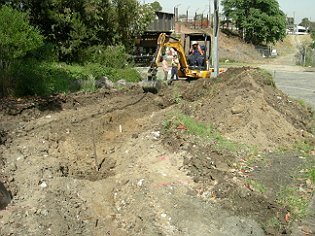 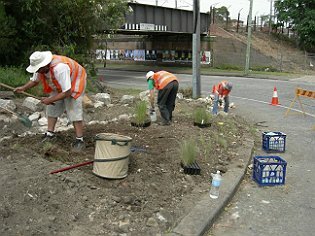 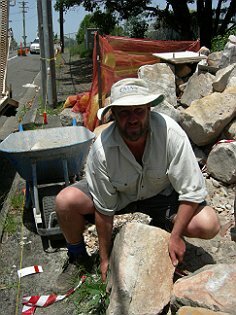 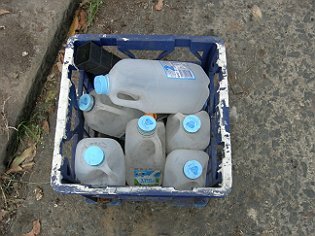 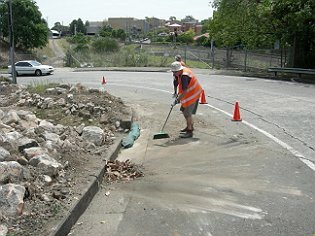 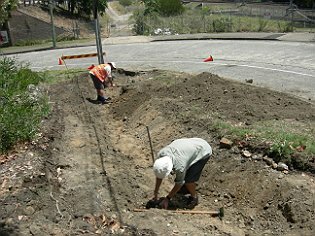 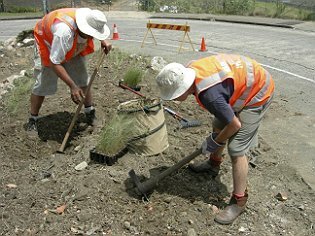 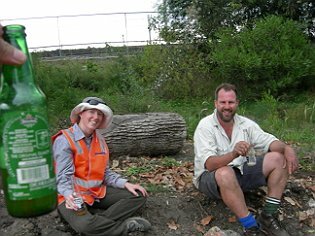 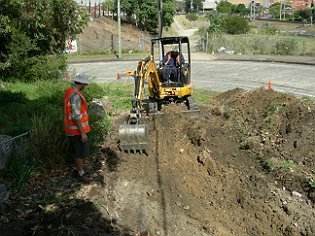 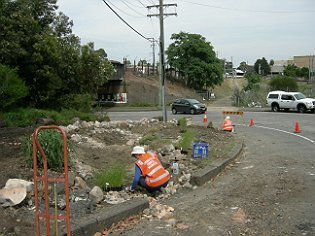 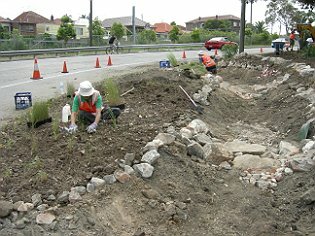 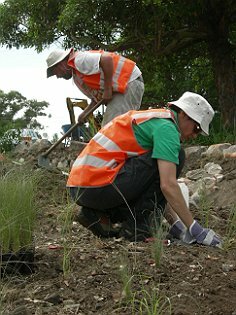 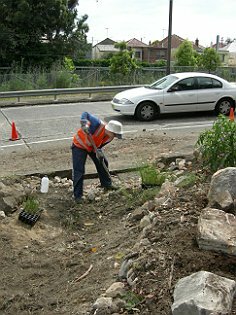 In November 2009, Bushpockets, a local community group, with the generous assistance of Sydney Metro CMA (funding), Marrickville Council (coordination, machinery, labour and land owner) and Equatica, built a stormwater treatment swale to treat road runoff for a street in Marrickville. 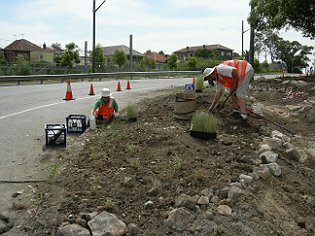 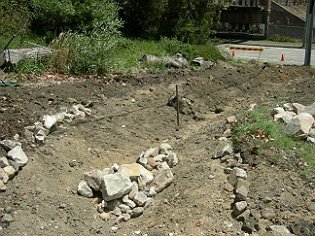 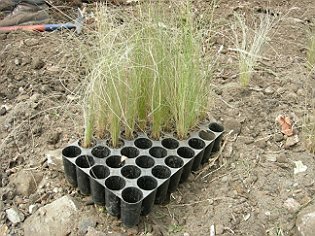 This page steps through the construction of the swale with lots of pictures; it's intended as a basic guide for anyone interested in constructing their own small treatment swale. 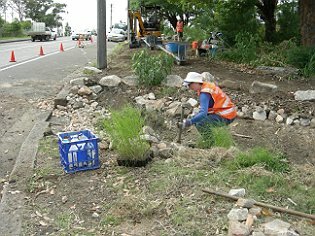 The plan for the swale was to divert water from the gutter on the road, into the swale, where water would be retained, filtered by the plants in the swale and allow some of the water to soak away into the soil. 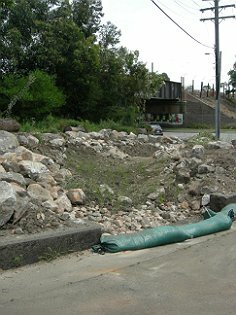 Excess flows would be returned to the gutter after being cleansed by the swale. 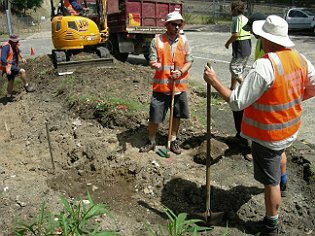 Cost effective: More than $20,000 value delivered for $8,000 in funding. 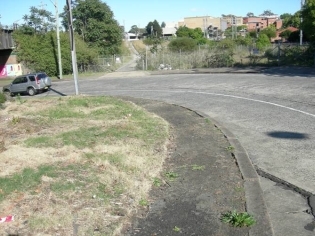 To help implement the design, we asked for some funding from the Sydney Metro CMA who responded with surpising speed. 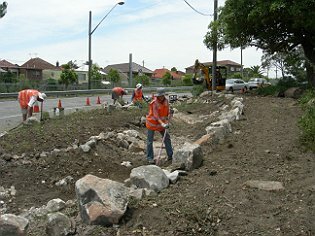 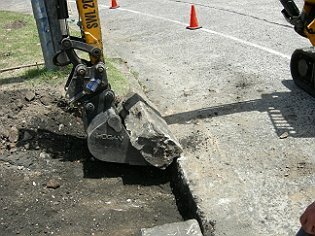 Marrickville Council came on board as a project partner and assisted greatly by providing a mini excavator and Hassan Iskander, the amazing operator, trucks to move the excavated material around the site, traffic control, insurance, and some essential bushcare equipment such as hats and vests. 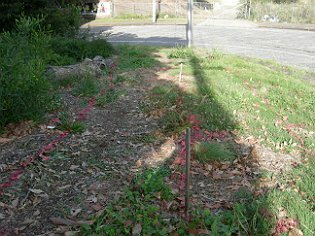 The afternoon before construction started we marked out the site with pink spray paint and some survey pegs. 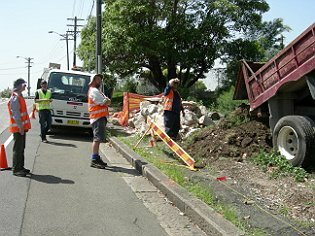 Construction began on Friday morning with the help of Hassan Iskander from Marrickville Council, Michael Easton and Equatica. 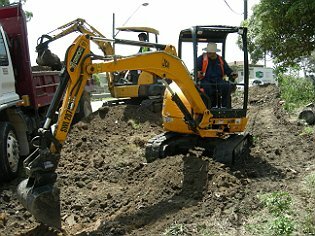 We began to excavate the swale, taking care not to damage an underground electical cable. 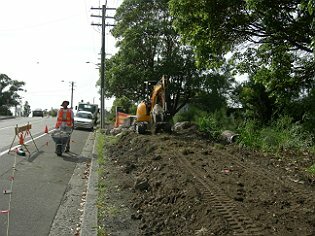 ...and that got construction going faster. 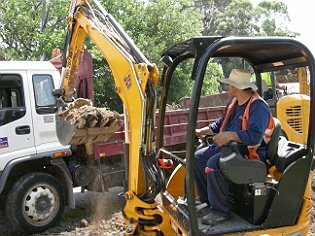 With the use of David Cleary and his truck and Jamie with another mini-excavator we could move dirt faster. 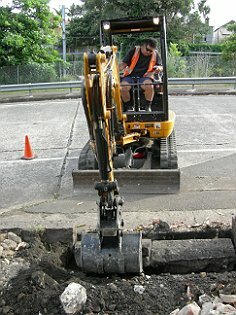 Just like playing with tonka trucks. 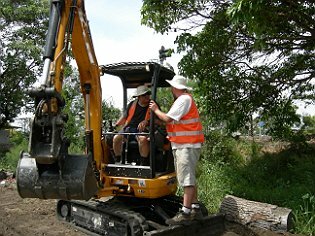 The excavation was under control which allowed us to catch up with Phill Birtles from the SMCMA. 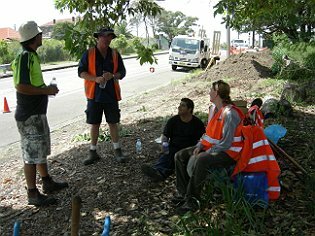 Considering that the temperature was now in the low 30s and Hassan was feeling the heat it was time for a well earned water break. 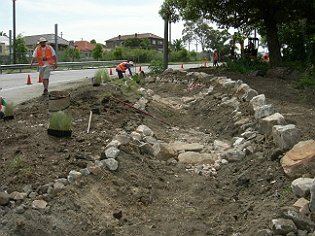 Once we had got the basic shape of the swale right, we started to work on the outlet of the swale. 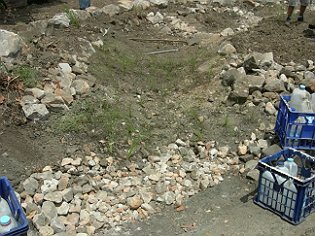 We created the outlet by reusing the large sandstone blocks. 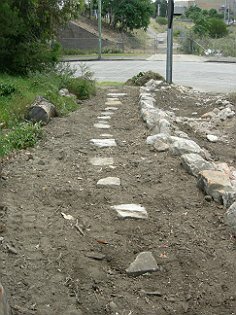 We relaid the blocks on their side. 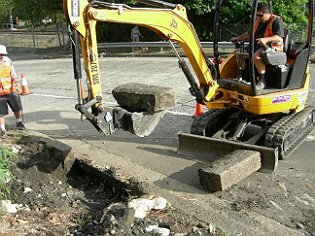 Hassan showed his great skill and dexterity with a mini excavator by picking these large blocks up with the bucket and placing them in the exact right spot so they would fit flush with the kerb and road. 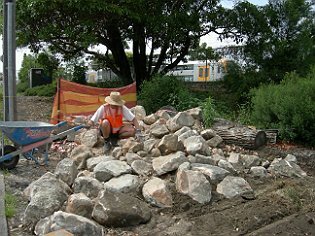 We had also started to create the rock weirs in the swale using the sandstone that Bushpockets has secured. 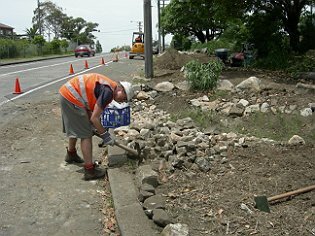 Rocks were moved by hand and wheel barrow down into the swale. 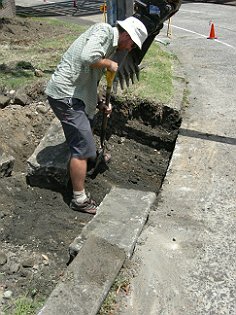 Bright and early on Saturday we started up on creating the inlet to the swale using the same technique as at the outlet. 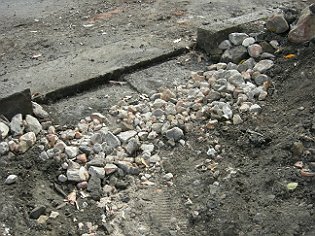 ...form the scour protection areas for the inlet and outlet of the swale. 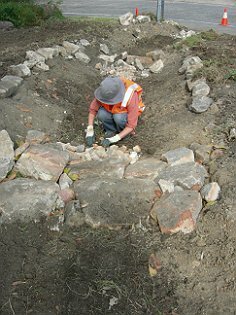 Alexa is carefully placing rocks in the rockweir of the swale to ensure that all the blocks are interlocking and stable. 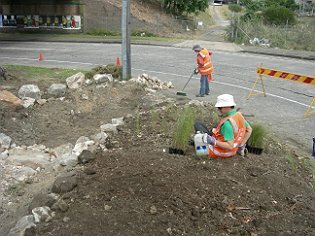 Claire begins to undertake the planting of the swale with Gahnia and Juncus. 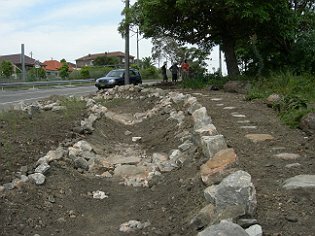 The completed scour protection zone - the result of Martin's handywork. 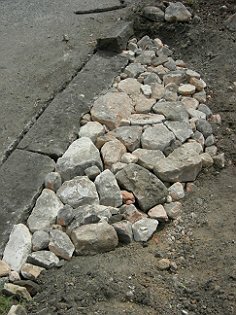 Note how the stones are placed neatly and all interlocking to create a smooth surface. 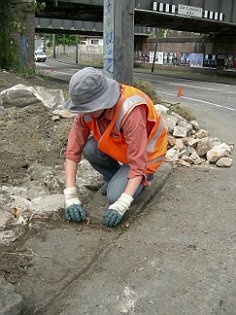 Alexa is filling in the gaps between the sandstone blocks to ensure a smooth finish with the road surface. 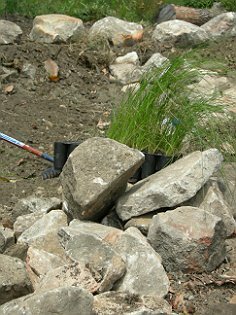 Some of the materials we used to create the swale. 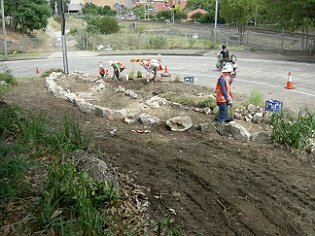 Michael and Martin start work on a small rockery as a feature for the site. 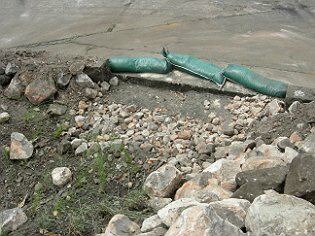 The inlet to the swale, with sandbag in place to allow the swale plants to establish. 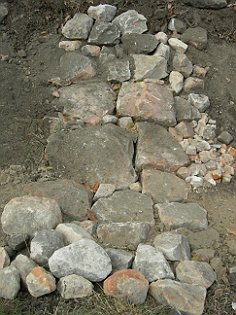 The newly created (and only half complete) path with sandstone stepping stones.